Two BU freshmen have gathered a social media following for their creative twist on a common childhood pastime: playing with food. Sophie Perez and Elizabeth Leach came together over their love of tasty concoctions. 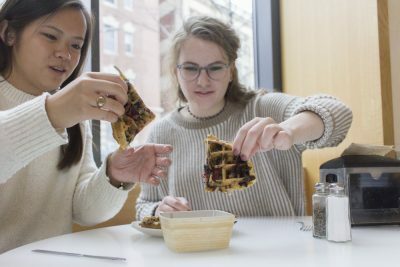 The College of General Studies freshmen recently started the Instagram account @bu.food.engineers, where they post inventive recipes made entirely from food available in BU’s dining halls. “It’s not maybe the most conventional food idea, but it’s still really fun and tastes really good,” Perez said. One of the engineers’ favorite concoctions is BUnicorn Hot Chocolate, which is normal hot cocoa topped with whipped cream, sprinkles and an ice cream cone. Maeve Hawk, also a CGS freshman, is a friend of Perez and Leach, and said she enjoys learning new recipes from them. “All [the ingredients] are always there and you never think of combining it,” Hawk said, describing the engineers’ nachos that contain potato chips, mango salsa and other unique items. The engineers began their food journey after meeting in a CGS class during the fall of their freshman year. They studied together and later began sharing meals on and off campus. The idea for their shared Instagram blog was born at a Cambridge Starbucks when Leach watched Perez cut into a cupcake in a unique way. “What the heck are you doing?” Leach asked as Perez rearranged the icing. Perez surveyed her creation and called herself a “food engineer.” Leach liked the name, and the two began to spy opportunities for creativity in the places they ate most often. Since then, Perez said, they text each other constantly about food ideas they have. Their account has been active since the beginning of this semester and has more than 500 followers. “We try to make [the recipes] as easy and comprehendible as possible because not everyone wants to spend a bunch of time making their own food,” Perez said. Though the recipes require extra effort, the engineers say the work is worth it. “We didn’t want to be another food account that just tries different foods around Boston,” Perez said. Perez and Leach use resources that students can access in the dining hall, like the microwave and waffle maker, to shape and heat food. One of their favorite recipes is the waffle breakfast sandwich, which is made of sausage, egg and bacon between quarters of a freshly pressed waffle. Most ingredients can be found in their raw form on the salad bar and at the ice cream station. One of their most recent dessert creations consists of chocolate chip cookies, peanut butter, banana, vanilla ice cream and Oreo pieces. Their eye for cuisine is paired with a clever social media approach. The duo says they try to keep their Instagram up to speed with relatable hashtags and clever puns. The engineers cite Buzzfeed’s Tasty as one of their biggest inspirations. Leach and Perez have used the recipe-sequence aesthetic of Tasty videos as a springboard for their own process. “We wanted it to look very nice but also be new and be creative,” Perez said. Their Instagram following has inspired the pair to extend their food interests across BU, and they spotlight friends who also enjoy creating original recipes. The duo has even discussed establishing their skills as a club at BU “so people can have as much fun as we’re having with it,” Leach said. Brilliant! And these are only first semester freshmen?? ?